(New York Post) AUGUSTA, Maine — A soldier who lost all four limbs during an explosion in Afghanistan hopes to inspire others with his story of how he recovered from his injuries and got on with his life partly by helping other amputees. 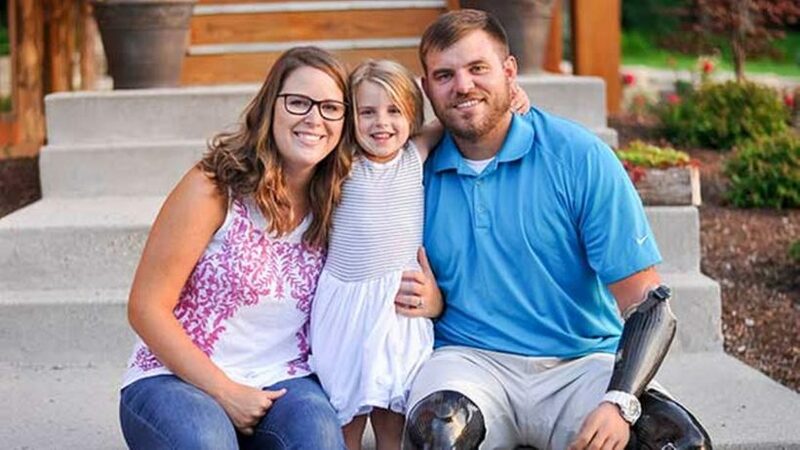 Travis Mills is raising his family, delivering motivational speeches and helping other wounded warriors through his foundation. 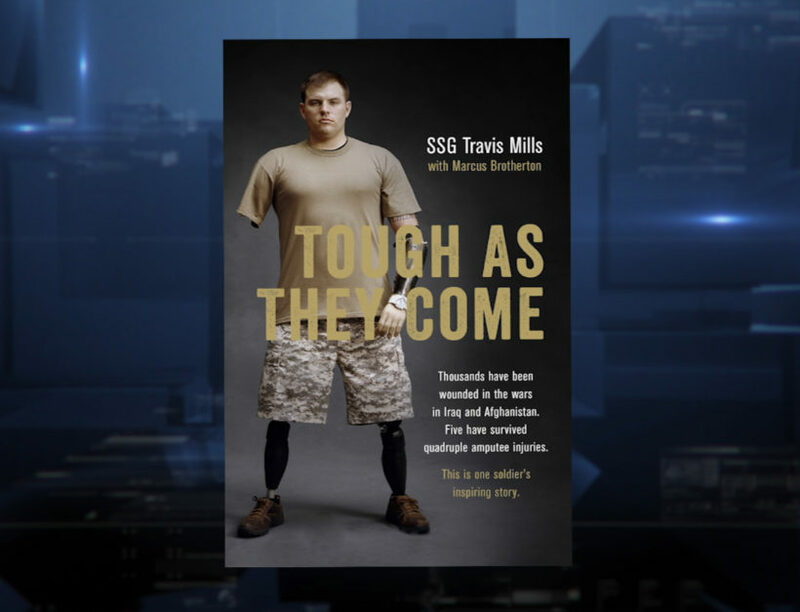 With his book “Tough As They Come,” he’s added author to his accomplishments. “My message is pretty clear. Never give up. Never quit. Find your motivation. Find your goals. And keep moving,” he said Tuesday. He joked with people at a bookstore, patiently signing books with a Sharpie, using his prosthetic hand. He’s right-handed and the prosthesis is on the left hand, making it even more difficult to write. Mills, 28, was an Army staff sergeant with the 82nd Airborne Division on his third deployment when an improvised explosive device (IED) detonated when he dropped his backpack on the ground during a foot patrol on April 10, 2012. The blast disintegrated his right arm and leg. 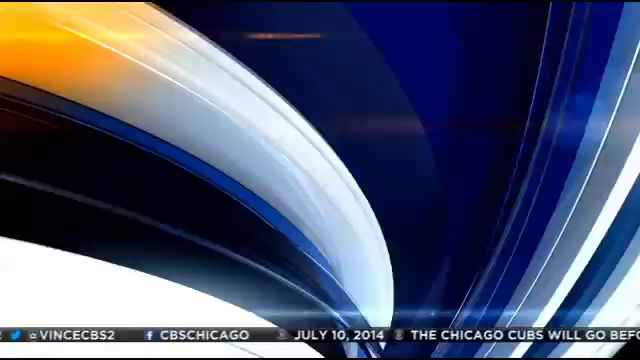 His other leg was left dangling and his remaining wrist was shredded. The former 6-foot-3, 230-pound athlete awoke four days later, on his 25th birthday, to learn he had no limbs. He endured 19 months of rehabilitation. He told his wife to leave, but she stayed by his side. Mills isn’t alone in having lost parts of all four limbs. He’s one of five quadruple amputees to survive the wars in Iraq and Afghanistan, and he’s met the others. Mills’ recovery was remarkable. He’s been snowboarding and mountain biking. He’s jumped out of planes. He’s started a foundation that bought property formerly owned by cosmetics pioneer Elizabeth Arden with a goal of transforming it into a fully accessible summer retreat to help other wounded veterans and their families. He’s visited war amputees at Walter Reed National Military Medical Center and traveled to Spaulding Rehabilitation Hospital in Boston to meet with Boston Marathon bombing victims who lost limbs. He’s happy to be able to provide hope. “I’m able to inspire and change people. I don’t do it by saying, ‘You think you have it bad? Then look at me.’ I’ll never play that card,” Mills said. Collaborating with Marcus Brotherton on a book that Mills describes as equal parts “Saving Private Ryan” and “Forrest Gump” seemed like a logical step because others draw inspiration from the story of a small-town boy from Vassar, Michigan, who’s managed to maintain a positive outlook after debilitating injuries. Tuesday’s book-signing event was the first near his hometown of Manchester, Maine, and the store ran out of books. Signings also are planned this month in Texas, where he lived after leaving the hospital, and in Michigan. Travis with his wife Kelsey and daughter Chloe. Mills said part of maintaining a positive outlook is keeping things in perspective. He said he’s lucky that modern medical care saved his life. He’s grateful that his wife, Kelsey, stuck with him. He’s happy to be able to make waffles for breakfast and to drive his 4-year-old daughter Chloe to pre-school every day. He said he’s living with scars, but he’s no longer wounded. “I don’t want people to pity me. I’m not a sob story. People need to understand that it’s up to them to change their outlook on life and how they view themselves,” he said. From the Associated Press. Reprinted here for educational purposes only. May not be reproduced on other websites without permission from The New York Post. 1. Who is Travis Mills? How did he get injured? 2. What has Travis been doing since he finished rehab? Be specific. 3. What is his message? 4. How is he planning to help others through his foundation? 5. What effect does he have on those he meets with? 6. How does Travis say he maintains a positive attitude? 8. How does Travis’ decision to not feel sorry for himself inspire/encourage you? CHALLENGE: Write a note of encouragement to Travis. How inspiring it would be for him to receive notes from some of you! Visit the TravisMill website or his YouTube page. To make a donation to the Travis Mills Foundation, go to travismills.org/donate. Read more about the foundation at: travismills.org/foundation.